I remember moving to Atlanta after college with the hope of creating my life. I waited tables, bar tended and wondered what my future held. I taught school for a year; started a non-profit; opened a restaurant, ran for city council and lost. At the time I thought my life was over. I was 26. I went to law school and dropped out after a year and half. A few years later I lost my job during the dot com crash and my life crumbled around me. I remember crying out and wondering why I was so miserable. Why my life wasn’t turning out the way I wanted it to? Why am I here? Writing and speaking came to me. I decided to go for it and remember watching speakers and reading their books and dreaming of writing and publishing a book that would impact the world. I wrote 2 books but they didn't make much of an impact. One sold so poorly I was told that no publisher would consider me. I wrote a book called The Energy Bus and thought "this is it." But it was rejected by over 30 publishers. I remember feeling the sting of rejection and crushing despair that my dream wasn't going to happen. In a series of fateful events the book found its way to Shannon Vargo at John Wiley and it was finally published. I was filled with excitement but then heard the news that bookstores wouldn't carry it. I went on a 28 city tour to get the word out but only a few people came to see me at each event. When I returned home from the tour and walked in the door and collapsed on the floor I could never have imagined then that my 17th book, The Power of Positive Leadership, would be released last week. It's a special book because it's a culmination of my life's work and journey. I write this with tears in my eyes knowing that through all the failures along the way I wasn't failing, I was growing and becoming. 1. Where you are now is not where you are going to be. 2. You don’t have to be perfect to start. Just start. 4. Sometimes you have to lose a goal to find your destiny. 5. You are here for a reason. You have a purpose and you are meant to live and share it. 6. You don’t have to be great. You just have to have a great desire to be your best and bring out the best in others. 7. Ignore the critics. Just show up each day and do the work. 8. Stay Positive. God has a plan! 9. If you believe your best days are ahead of you, they are. The best is yet to come. 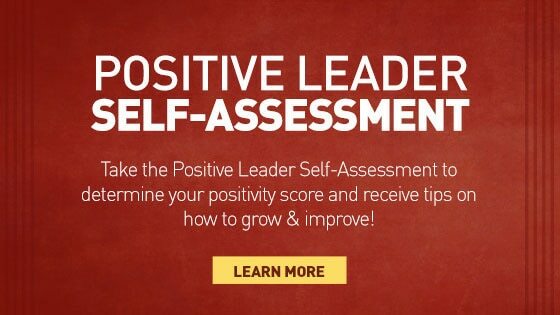 find your positivity score and receive tips on overcoming negativity. Based on the overwhelming response, we've decided to extend your opportunity to download a complimentary Power of Positive Leadership Action Plan through May 4. 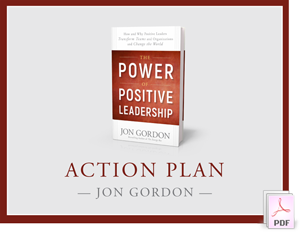 A 26-page "Power of Positive Leadership" downloadable accompaniment Action Plan to help you and your team turn the ideas from the book into results. To take advantage of this offer, order from Amazon, Barnes & Noble, Books-A-Million or 800CEORead then complete the redemption form here.